Pilocytic astrocytoma, juvenile pilocytic astrocytoma, or cystic cerebellar astrocytoma is a brain tumor that occurs predominantly in children and involves the midline, basal, and posterior fossa structures. It is, in general, considered a benign tumor of childhood. It is often cystic, and, if solid, it tends to be well-circumscribed. It is characteristically a contrast-enhancing tumour by current imaging investigations (e.g., CT scan, MRI). 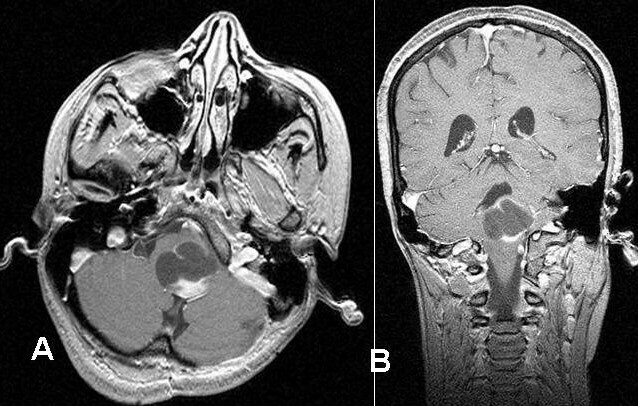 Stereotactic MRI brain showed recurrent postoperative brain stem cystic pilocytic astrocytoma.